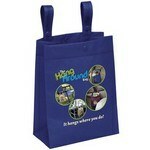 More and more shoppers and the stores they shop at are going green, making a branded shopping and grocery tote bag an excellent way to promote your company and remind your customers that your care not just about their business but their community too. 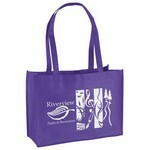 Enviro-Shopper bag is an ideal replacement for plastic shopping and grocery bags. It is made from non-woven polypropylene – 100GSM. 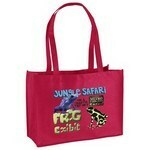 The promotional franklin tote bag - four-color process is made of 80 GSM premium non-woven polypropylene. 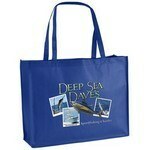 This custom logo franklin tote bag - screen printed is made of 80 GSM premium non-woven polypropylene. 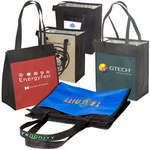 This custom logo George tote bag - four-color process is made of 80 GSM premium non-woven polypropylene. 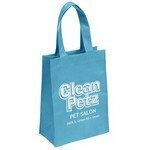 Our branded George tote bag - screen printed is made of 80 GSM premium non-woven polypropylene. 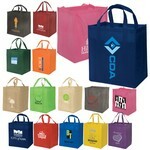 The promotional hang around bag - four-color process is made of 100 GSM premium non-woven polypropylene. This custom logo hang around bag - screen printed is made of 100 GSM premium non-woven polypropylene. 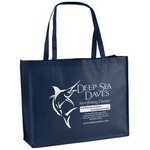 This custom logo ike tote bag - screen printed is made of 80 GSM premium non-woven polypropylene. 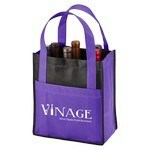 The Toscana Six Bottle Non-Woven Wine Tote features 80 GSM polypropylene construction, Customizable with your brand logo. Being eco-friendly doesn’t mean that you can’t be stylish! 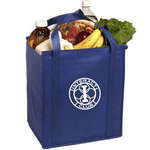 Insulated Grocery Tote is an Eco-Responsible™ product. 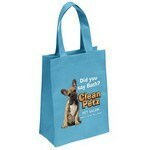 This is an eco-friendly product made from non-woven polypropylene – 80GSM.